Anticipatory Grief often begins to occur in the mid - late stages of Alzheimer's disease, and allows one to become emotionally prepared for the inevitable. As Ed’s mental capacity declined I became more and more depressed and felt overwhelmed by the prospect of his approaching death. Then when I finally arranged for hospice care I began focusing almost exclusively on how I would feel after he died. I became acutely aware that the time was coming closer and closer. I had trouble carrying out my usual daily life activities and would often sit at home numbly staring at the TV without understanding what was being shown. I was suffering from what is called anticipatory grief – grief that occurs while awaiting death. The present article focuses exclusively on anticipatory grief. Paula Spencer Scott, writing on Caring.com, in an article entitled "How to Cope With the ‘Living Death’ of Alzheimer’s", says that when dealing with Alzheimer’s this grief most often occurs in the mid- late-stages of the disease, as death is seen to be quickly approaching. Although anticipatory grief doesn’t always occur, when it does it’s important to understand it’s normal. The Medicine.Net article states that symptoms of anticipatory death include: depression, extreme concern for the dying person, preparing for the death, and adjusting to changes caused by the death. An article on Harvard’s Helpguide.org lists additional symptoms such as -- sorrow, anxiety, anger and denial. Anticipatory grief when a loved one has Alzheimer’s is similar to that which occurs with other terminal illnesses, but also has some distinct features. The chief among these is loss of the person one used to know – which doesn't typically occur with other medical conditions. 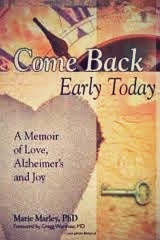 Read books or listen to tapes designed for caregivers. In my experience, the single most important way to cope with anticipatory grief is to stop focusing on the person’s impending death and begin focusing on how you can improve their quality of life in the time that’s remaining. and taking him more stuffed animals, each of which he loved more than the one before – just to name a few. Once I began doing these activities, my anticipatory grief lightened considerably and we had a beautiful conclusion to our 30-year relationship. Does anyone have any other strategies that helped you deal with anticipatory grief?